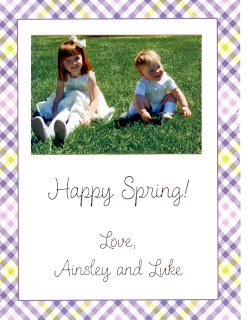 To share Spring greetings with friends and family I sent out this card. I used a small, flat card from Boatman Geller. The card is an adorable green and purple gingham. I printed wallet sized photos of a picture of the kids at Easter and placed them on the top of each card. A fun way to send greetings anytime of the year!